Exceptional productivity now fits perfectly in any workspace. 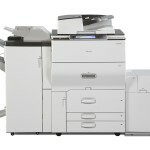 The RICOH Aficio MP C300/MP C300SR Color Digital Imaging System offers true multifunctional versatility, advanced workflow capabilities and astonishing speed—all in an amazingly compact system. 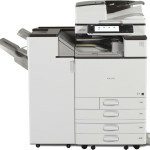 The smart, sleek design includes tools and capabilities that maximize efficiency and ensure low total cost of ownership. Multiple security features provide strong lines of defense for documents and data. 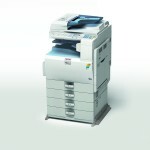 It’s the ideal solution for smaller workgroups. 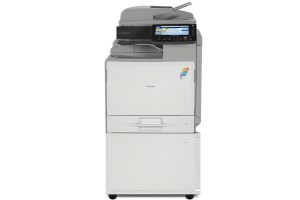 ● Produce attractive documents quickly with resolution up to 1200dpi and reliable 32 page-per-minute output speed. 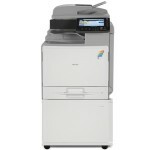 Automatic duplexing, 50-second warm-up time, and intuitive controls complete the productivity picture. ● Streamline document production with a flexible paper supply and a total capacity up to 2,300 sheets of 8.5″ x 11″ and 8.5″ x 14″ paper. This extensive amount minimizes replenishment and strengthens overall productivity. ● Store up to 3,000 documents on a standard Document Server that allows you to easily find, retrieve and share the files you need. ● Load paper and get back to work quickly with simple, ergonomically designed reverse-grip paper trays that easily return to their original position. ● Replace toner cartridges with one hand in a matter of seconds. ● Drive office efficiency with a logical touch screen display that clearly leads users step-by-step through each process. The tiltable display panel even accommodates color-challenged users with special settings. ● Distribute hardcopy documents faster and be more productive than ever with Scan-to-Email. Without adding any additional software or hardware, you can scan, preview and send documents to a personal address for forwarding—or directly to other email addresses. ● Reduce network traffic while uploading a variety of business documents—such as proposals, catalogs, brochures or financial reports—to a shared server with Scan-to-FTP. It’s a fast and convenient way to make documents universally available to authorized users. ● Convert documents to your choice of electronic formats including PDF, TIFF and JPEG and store them on a USB Clip Drive or SD Card. ● Convert hardcopy documents into High Compression PDFs using the JPEG 2000 image compression standard to create small, portable files with uncompromised image quality. 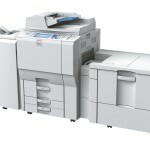 ● Expand system performance with optional Ricoh GlobalScan NX software for advanced scanning capabilities. ● Reduce the threat of unauthorized users retrieving and printing documents with the standard DataOverwriteSecurity System (DOSS) feature. DOSS instantly overwrites the hard drive after every job. Standard Hard Disk Drive (HDD) Encryption further protects documents and data, even if the hard drive is stolen. ● Control access to the system or specific features with various levels of authentication. These proven security measures reduce the chance of unauthorized users accessing documents, data and passwords. ● Enhance security and make both log-in and IPP passwords harder to compromise with Scan-to-Webmail (SMTP over SSL). ● Safeguard against unauthorized viewing of confidential documents with encrypted PDF transmission. PDF data is automatically encrypted prior to transmission via Scan-to-Email and Scan-to-Folder. ● Track costs and reinforce economical supply usage with the innovative User Account Limit feature. It allows you to assign amounts of output— or color usage—for groups or individuals. This helps keep supply costs low and highly predictable. ● Manage critical functions—such as system settings, print job status and supply levels—remotely with Web Image Monitor. Virtually every function performed at the system can be handled remotely with this robust, web-based tool. ● Eliminate the cost and hassle of manual meter data submissions with the automated simplicity of @Remote Intelligent Management. ● Build custom applications or integrate off-the-shelf software products with an easy-to-use Software Development Kit (SDK). Ricoh Embedded Software Architecture (ESA) gives you the freedom to automate processes, optimize workflow or add accountability to your network. ● Support a full range of print streams with standard PCL5c/6, genuine Adobe® PostScript® 3™ and support for XPS. ● Empower end-users with varying network requirements by providing them with an efficient multifunction solution. The device offers easy integration for Windows, Macintosh or UNIX environments with standard 10Base-T/100Base-TX Ethernet and USB 2.0 interfaces, as well as optional Gigabit Ethernet and IEEE 802.11a/g interfaces. ● Create brilliant, full-color documents from PDFs without the need to open each file with PDF Direct Print. This minimizes wait times and alleviates network congestion. ● Shorten the time it takes users to set up and complete print jobs. A one-click, graphical icon-based user interface with the PCL6 or standard PostScript3 driver requires limited mouse clicks to set up print jobs. 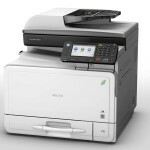 ● Print directly from a laptop, handheld device or smart phone securely across the Internet without device-specific drivers, special software or a LAN connection using the Ricoh HotSpot MFP option. ● Increase the speed of your fax communications and greatly reduce phone line costs with a Super G3 fax modem that transmits an average page in two seconds or less. ● Transfer incoming fax messages to selected e-mail addresses, so users can receive and review documents from any PC— even if they are away from their offices. 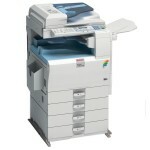 ● Send or receive faxes electronically with Internet (T.37) faxing or PC-based LAN faxing. 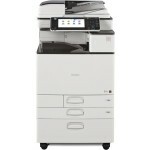 Users can also select IP (T.38) and Super G3 faxing for quick delivery to conventional fax numbers. ● Control expenses with the Ricoh Aficio MP C300/MP C300SR which provide a powerful combination of high productivity, long-lasting reliability and low total cost of ownership (TCO). ● Consolidate copying, printing, scanning and document management into a single device, with a smaller footprint and one set of consumables. 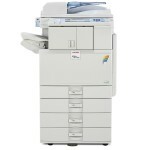 ● Place the appropriate device for the right applications with these systems and others—all part of our extensive line of Ricoh products.